Last week, on Friday, my husband was on the front page of our local newspaper, the Columbia Tribune! In vitro fertilization, once a long shot for couples unable to conceive naturally, is becoming a much better option thanks to new technology, but high costs still prevent some couples from pursuing the treatment. 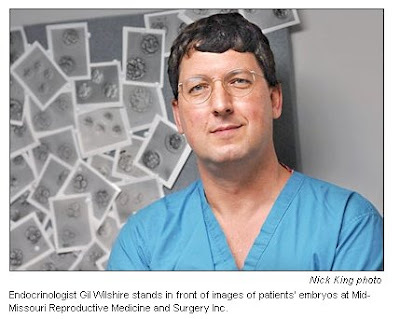 During a recent interview, Gil Wilshire, endocrinologist at Mid Missouri Reproductive Medicine and Surgery Inc., practically jumped out of his seat when discussing the rate of IVF pregnancies, embryos that were successfully implanted. "I can’t even believe I’m giving this to you," he said, sliding a piece of paper with his office’s statistics across the desk. "Last month I did five transfers, and four got pregnant. ... That’s incredible." Last year, Wilshire said, his office broke all internal records. It saw a 44 percent success rate for patients between the ages of 38 and 40 years old and a 67 percent success rate for patients ages 35 to 37. Patients older than 40 were successful 17 percent of the time. Those numbers are significantly higher than the most recent national rates, which are also on the rise. Mid Missouri Reproductive performed 56 total IVF cycles in 2007. The Missouri Center for Reproductive Medicine and Fertility at Columbia Regional Hospital, the other large fertility clinic in town, had a slow year, with only two pregnancies out of nine IVF cycles. But the center has just completed a move into a $1.4 million renovated fertility clinic at Columbia Regional Hospital, and doctors say they’re expecting a big 2008 and 2009. "We’ve been a two-site program for the last five or six years," said Danny Schust, one of two endocrinologists at the program. Schust said the laboratory was previously housed at University Hospital and the clinic was at Columbia Regional. "It was disjointed. It really makes no sense," he said. "So we’re excited to have it all together." There are other reasons for optimism. In vitro fertilization has switched from a simple numbers game, where doctors tried to overwhelm long odds with large numbers of sperm and eggs, to a more precise science. "Back in the early ’90s, when I did my fellowship in reproductive medicine and endocrinology, a good success rate was 14 percent," Wilshire said. "We were groping in the dark as a profession. We’d put a bunch of embryos up there and pray to God, hopefully the embryos would stick and you’d get a pregnancy in there." If a couple decides to undergo the costly IVF treatment, doctors first prescribe a drug - gonadotropin - that stimulates ovulation to cause the woman’s body to release multiple eggs. They remove eggs from the woman and place them in a petri dish protected in an incubator. The doctor then has two choices: pour sperm over the egg in hopes that one will make its way in or, in cases of men with low sperm counts, use a "micro manipulator machine" to inject a single healthy sperm into the egg. Then it’s time for the fertilized egg to grow. One of the most exciting advances of recent years is the "medium" used to replicate the fluid of the womb. This medium - made up of amino acids, sugars and nutrients - has been perfected by scientists to replicate conditions in the womb. Whereas 10 years ago doctors would have to implant the embryo in the womb after one or two days in the petri dish, they now can wait five days, until the embryo has divided into eight cells and is well on its way to becoming a fetus. "The real advances are in the IVF lab. I wish I could say the doctors are getting better, but I think it’s the embryologists who are getting better," Schust said. But the doctor’s skill comes next. After five days, he or she must remove one or two of the fertilized eggs and implant them near the top of the womb. Wilshire said when he began practicing, he would put in four or five embryos just to be sure one would take. Today, he says, he rarely puts in more than two. Wilshire proudly wielded the "coaxial catheter," a thin, rotating pipette used to do the implantation. "I liken it to fly fishing," he said. "When you’ve got crystal-clear water and you’ve got a big trout in the pool, if you even look in there or drop a stone, it scurries away - it’s very scared and skittish. However, if you’re a good fly fisherman, you’re way away and you cast just right, then the fly goes out and it goes ... down real lightly like a natural fly, and the trout comes up and gets hooked." None of this is cheap, however. IVF cycles typically cost about $7,000 without medication. Once the medications are included, that figure can rise to $10,000 or more. In Missouri, group health insurance policies are not required to cover IVF, but a bill sponsored by Rep. Steve Hodges, D-East Prairie, would mandate that all policies covering more than 25 employees cover the treatment. Hodges said he got the idea for legislation after hearing the story of a New Madrid couple who needed help from family members to pay for IVF. "For people who want a child that badly - and the procedure is fairly taxing, not counting the expense and emotion involved - I just thought, ‘We spend lots of money trying to save lives, why not spend some money trying to create one?’ " Hodges said. "I have a saying: ‘A good thing is always a good thing,’ and I think this is a good thing." Congratulations to the sucess of the implantations and to all the happy parents. That must be very satisfying work. Congrats to your husband for making the first page. You guys are a heck of a team. ;-) I'm glad he's doing so well. I don't know if this comment will get through the moderation, but I'll try anyway. I disagree with the idea for trying to get insurance companies to pay for IVF. I'm all for families who want a child being able to raise one, but instead of putting more burden on those of us trying to pay for health insurance as it is, why not instead help people embrace their crosses in life and encourage less abortions and more adoptions?! I would just like to say that from the standpoint of cost (which the previous poster brought up from a different perspective), this truly marvelous improvement that reduces the number of multiples with their high rate of lifelong learning disabilities and other problems way more than saves any cost that would be passed on to the public by covering the procedure with health insurance. It can cost $50,000 a year (or more) to educate just one multiply-handicapped child. That is so AWESOME!!! CONGRATS to your Husband!! I have a kind of weird take on the less-abortions-more-adoptions schtick. I used to believe that too. Then I learned some things about attachment theory, child development, and various social issues. I also considered my own experience of being unfairly demonized to the point that I lost my son permanently. (He has a central auditory processing disorder which caused him to be as much as a year behind in his verbal skills and which was not diagnosed until well after his grandparents had adopted him. All that time they assumed I had somehow caused his problems.) As such I can no longer agree with the practice of using lesser-advantaged women as brood mares. The statistics say it all: when you control for financial issues, lower-class women can be every bit as good mothers as middle- or upper-class, and adopted children, even those adopted as infants, have a lot more behavioral problems. My daughter cried for me after her birth and ceased only when she heard my voice again as they brought her in to me from the nursery. They know. Losing their mothers is a wound that never completely heals, although some of them muster up enough bravado to pretend it doesn't bother them. We need to stop pretending that mother-baby pairs can be broken up and mixed up into more socially pleasing arrangements with no consequence to the biological mother or the child whatsoever. I mean, I haven't even gotten into how much this damages the "birth mothers" too. So, if someone is not going to deal with the hand they're given and accept that they can't produce children without medical intervention, I actually would rather see them pursue IVF or similar technologies. I would also like to see social advances made such that a mother-baby pair which is struggling is given every opportunity to stay together without the mother being shamed or guilt-tripped into believing something that just isn't true: that because of her race or her socio-economic status, she is incapable of being a good mother. I hope I am not asking for too much here. My son could be with me to this day had I had the resources to hire a good lawyer and had I not faced social censure for trying to keep him and support him on government handouts. Lots of other women are in the same boat even now. Small wonder they choose pregnancy termination over a broken heart, and sometimes not even that works. I'm pro-choice, but I want it to be a real choice, not "I got an abortion because it was that or have my child taken away from me."